Big roller skate wheels for long glides. CLICK HERE FOR MORE INDOOR RINK WHEELS Roller Bones Team Roller Skate Wheels 57mm 98a (8) Quality artistic skate wheels. 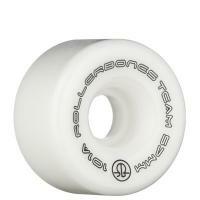 57mm x 30mm, 98a. Available in Black, Blue, Green, Pink and White. Powell Bones Elite Roller Skate Wheels 57mm 101a - 8 pack - 4 colors Competition quality skate wheels. Powell formulates this wheel to roll more smoothly and last longer. Powell Bones Elite roller skate wheels 62mm 103a - 8 pack Powell Bones Elite roller skate wheels 62mm 103a Red- 8 pack Competition quality skate wheels. Powell rink wheels roll smoothly and last longer.